Our waitress rushing out, concerned my husband left his bag behind. Thanks! 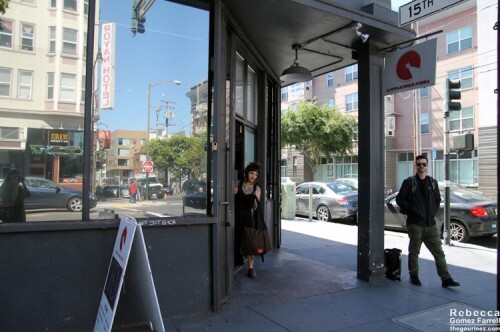 Little Star is a small gourmet-pizza chain with three outlets in San Francisco. We chose it for an early dinner on a Saturday afternoon because it had the best ratings for open eateries in that neck of the Mission at that time, aside from the also-appealing arepas spot across the street. At 3 pm, the place was empty, which is to be expected for most establishments. The menu is tiny, roughly five types each of deep dish and thin crust pizzas and about the same amount of appetizers and salads. Those pizzas come in small 9” and large 12” only, though personal pan pizzas are available at lunch for a reasonable price. The color palette was cool tones, which I like, and the small bar at the entrance was especially cute. Medium-to-dark woods, silver tables, brick and sleet gray walls. 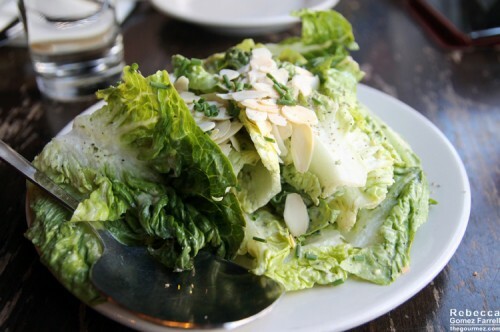 We started out with the goddess salad, little gems lettuce with creamy pesto dressing, chives, and toasted almonds. I thought the lettuce was actually chopped romaine and was wondering why I was robbed of baby lettuce, only to learn while writing this that little gems is actually a lettuce varietal and not just a fanciful menu description. The more you know, and now I know that little gems pretty much taste how they look: like romaine. The pesto dressing was just enough to coat, showing restraint, and it had plenty of herbal flavor to boost what would otherwise be a simple salad with few ingredients. Between the lettuce and the almonds, it was delightfully crunchy. We split a 9” pizza, the perfect size for me and the husband with a starter salad. We weren’t in the mood to overdose on fillings so we avoided the deep dish and chose the Italian thin crust instead. 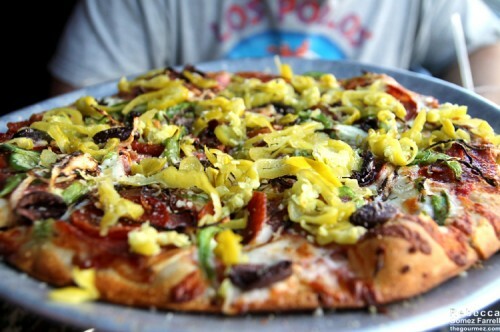 It comes with pepperoni, salami, banana peppers, Kalamata olives, onion, and green bell pepper. The pizza was great! Extra-crunchy crust with a tasty olive-oil wash. Of the ingredients, the onions that were baked nearly to ashes and the meats provided excellent flavor. Every inch of it was covered in toppings, but they were sliced very fine, which kept most of them on the slice rather than sliding right off—bonus points! The Italian wasn’t the best pizza I’ve had, but it definitely cured our hunger and left an impression. I’d like to try this spot again when it’s hopping to get a better feel for its vibe, and my curiosity about how their deep dish pizza compares with the thin crust will bring me back in to do just that.